Just in time for Chanukah, ArtScroll is sharing a download of the complete laws of Chanukah with its readers, selected from the digital version of the Kleinman Edition Kitzur Shulchan Aruch, part of the Wasserman Digital Initiative. Within the app, click on the menu, then click on the second option for the store. 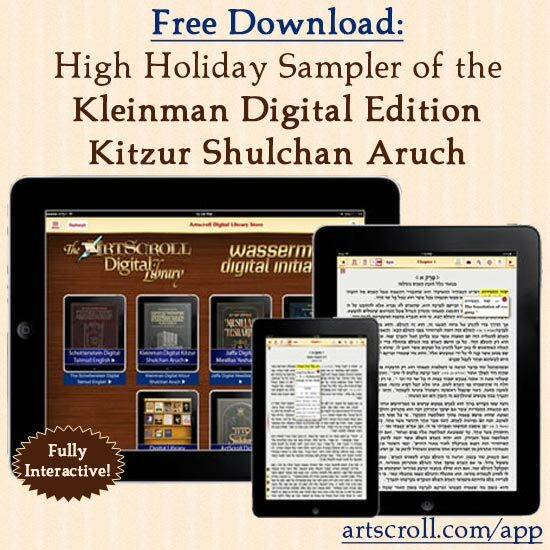 Scroll down to the Kleinman Digital Kitzur Shulchan Aruch and click on the icon. Look for theoption under “purchase volumes” that says Kitzur Shulchan Aruch Free Sample – Chanukah. Click where it says free on the right side to begin your download. The free sample will now appear in your library. You can browse, learn end experience the new features. 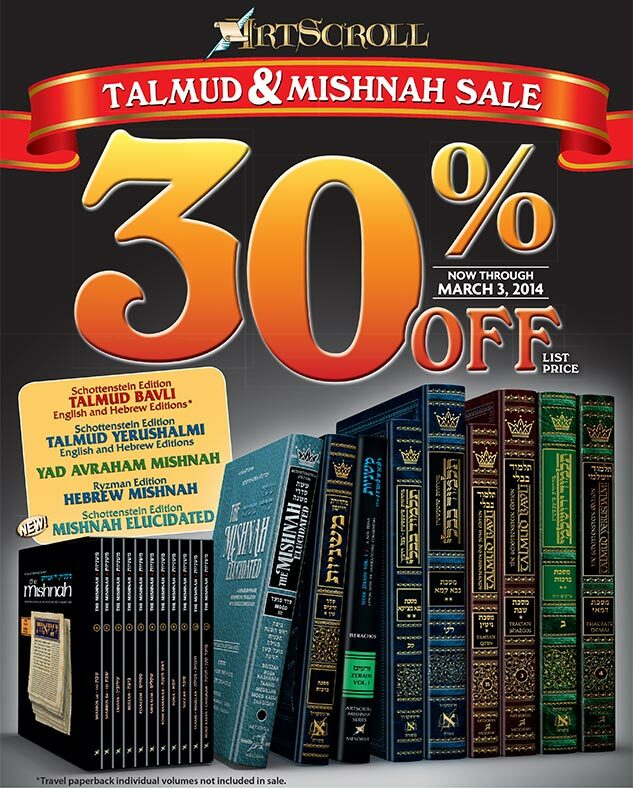 Shop ArtScroll’s 30% Talmud and Mishnah Sale Before It’s Too Late! ArtScroll’s Talmud and Mishnah sale continues! 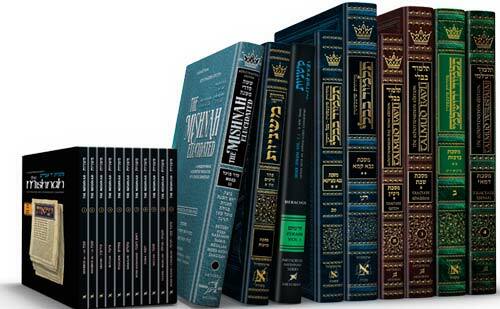 Shop now before it’s too late to save 30% on ArtScroll’s renowned selection of Talmud and Mishnah series. Don’t forget – get free shipping at ArtScroll.com on all orders that are over $49 (in the USA)! Take this great opportunity to fill in any volumes missing from your set, or purchase a complete set for your shul, yeshivah, son-in-law or yourself! Click here to begin saving. Schottenstein Edition Talmud Bavli: With its flowing translation, clear elucidation, diagrams, vowelized text, and introductions to the tractates and individual topics, the Schottenstein Edition Talmud Bavli has earned world-wide acclaim and transformed the lives of tens of thousands of people who are making Talmud study a vital part of their day. Schottenstein Edition Hebrew Talmud Bavli: Designed for those who prefer to study in Hebrew, this edition has achieved wide acceptance and praise. In Israel and America, the “Blue Gemara” is everywhere. Schottenstein Talmud Yerushalmi: A translation and elucidation that has made the wisdom of the Yerushalmi accessible to thousands who are now able to revel in its study. This groundbreaking work is available in both Hebrew and English versions. Yad Avrohom Mishnah: A major series that includes clear translation, diagrams and illustrations, and the extensive Yad Avraham commentary covering a full range of commentators. Schottenstein Edition Mishnah Elucidated: Newest addition to the ArtScroll library, the elucidated translation adds words and phrases to make the Mishnah text clear, while notes clarify the Mishnah further. This is ideal for those looking for a basic yet thorough approach – people studying for a yahrtzeit or sheloshim and young people or adults who have limited time but want a clear understanding of Mishnah. The full Seder Moed and Nashim vol. 1 have been published, with other volumes in preparation. Ryzman Edition Hebrew Mishnah: This Hebrew-language elucidation of Mishnah enables readers to learn at many levels. It includes the Mishnah text and the Rav’s commentary, newly-typeset; a phrase-by-phrase translation and elucidation, in readable Hebrew; an expanded explanation of the Mishnah; an “Iyunim” level for in-depth study, and a summary of the halachos that emerge from the Mishnah, as presented in Shulchan Aruch. ArtScroll Schottenstein Digital Talmud: Combining the classic format and translations of the ArtScroll Schottenstein Talmud with cutting edge technology and a ton of interactive and innovative features, this digital edition of the Talmud allows you to carry multiple volumes – or even the entire shas – in the palm of your hand! Get the entire Shas for less than $600, or individual volumes for just $9.99! Click here for details. Hurry! Sale ends on March 3rd – shop now before it’s too late! Click here for instructions to download a free sample. 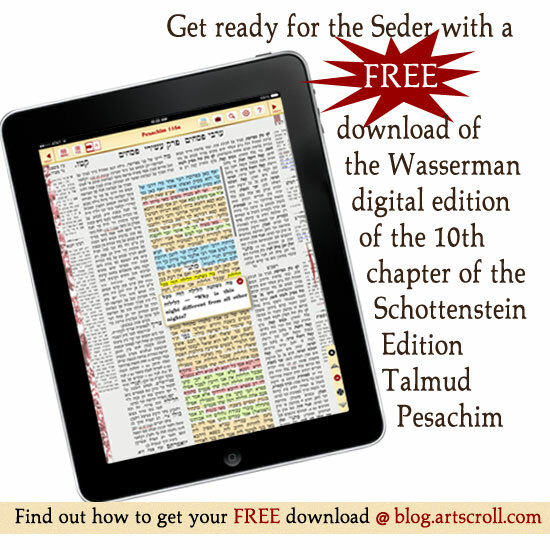 In the two years since its release, over fifty thousand users have discovered the ArtScroll App and the Wasserman Digital Initiative. With interactive features and the ability to carry multiple Talmud volumes in the palm of their hands, the Schottenstein Digital Edition Talmud Bavli has transformed the way people learn Talmud on the go. And now, after years of development, we’re happy to announce that the Wasserman Digital Initiative is expanding. No longer is the ArtScroll Digital Library focused on the Talmud alone. With two new digital editions now available, and multiple new projects on the way, the ArtScroll App is opening the doors of learning and Torah study for hosts of new users. Carry all five volumes of the renowned Kleinman Edition Kitzur Shulchan Aruch in the palm of your hand, while having access to the groundbreaking and interactive features of the ArtScroll digital library – at less than half the cost of the print edition. Combine the classic phrase-by-phrase translation and explanatory notes that the Jaffa Edition Mesillas Yesharim is known for with the state-of-the art innovative digital features of the ArtScroll app, for less than half the price of the print version. Need the translation of a Hebrew word? Simply tap on the word and watch its translation appear. Using the English translation and footnotes feature? Watch them scroll synchronously as you scroll through the Hebrew text. When you look up an entry in the Table of Contents, you don’t need to scroll or flip to your desired page. Simply tap on the Table of Contents entry and you’ll go right to the page you want. This feature works for the footnotes and index as well. Talmudic references don’t need to send you to the bookshelf to pull out another volume. Tap on a footnote and you can bring up the portion of the Talmud it references. With the digital editions, you can add notes, bookmarks and highlights, and you can view them on your other devices. Click here for all available digital editions. Stone Digital Edition Tanach: In development … stay tuned for details. To celebrate our newly expanded digital library, we are offering a free sample portion of the Kleinman Edition Digital Kitzur Shulchan Aruch, dealing with the laws of the High Holidays and Succos. If viewing this on your mobile device with the app installed, simply click HERE to open the free download in your app. Look for theoption under “purchase volumes” that says Kitzur Shulchan Aruch Free Sample – High Holidays. Click here to learn more about the newly expanded library and all of the exciting and innovative new features.